Romancing the Genres: City Girl or Country? I have always felt about the country as Jane Austen’s Mr Bingley. When I’m in the city I love it, when I’m in the country I think I could never leave. Being a Piscean, it figures, we have wide ranging tastes. I like the beach and the bush, the fast paced city life and the calmer quiet of a country town. But I think it’s also something to do with having been exposed at a young age to both lifestyles. Although I’ve spent most of my life living in a suburb north of Melbourne I've had many holiday visits, staying with relatives in the country. I could never say which is better, city or country. I love them both but which do I feel I fit with most? My parents were raised on farms in Tasmania, but I’m a first-generation Melbourne city girl. I first discovered the joys of the shops in the city during school holidays. Mum and I would catch the tram into ‘town’ as she called it. We’d shop all day up and down Burke Street, visiting David Jones, and purchasing fabric and dress patterns from Clegs. We’d always break for lunch in Myer’s cafeteria where I would have a banana split for desert ( A scoop of vanilla ice-cream, a banana split in half on either side and topped with whipped cream, caramel topping and chopped peanuts). I never had it any other time. Such a treat. But also during school holidays I would stay with my cousins in Gippsland for a week. Their Dad was a worker on a massive working farm and they lived on the property. I loved being able to roam wide open spaces with my cousins and connect with the animals. We’d feed the horses through the fence and go to visit the working dogs in their kennels. At times there was excitement like when we found ourselves in a sheep paddock and they started chasing us. The ewes were lambing and had decided we were a threat to their little ones. Also there were magical times. A favourite memory is sitting with my younger cousin in a patch of wild flowers making daisy chain necklaces and wreaths for our hair. She taught me to split the stem and thread the next flower through it. I remember the bees buzzing softly around us and the sun warming my back and making everything smell grassy sweet. When a bit older I went to a country dance and fell a little in love with a sweet young man who lent me his jacket when I was cold. But the city held it’s magic too. Returning home after a country stay it was dusk by the time we reached Melbourne. I asked Dad to take the route through the city so that I could see all the city lights. He did as I asked and to me the city looked like fairyland. When I went to my first Romance Writers of Australia conference in Melbourne I had a room overlooking the Yarra River. Before going down to the cocktail party, the view of the city lights reflecting in the river captivated me. They still feel like fairyland lights to me. As an author, I have so far drawn from my city girl experiences. Not only the magical glamour of the city lights and the luxury of expensive hotels but also my working life as a bookkeeper. I took pride in dressing up professionally in pencil skirts and high heels. The men looked their very best in business suits but more than that it was pride in doing interesting important jobs. I worked as a temp for quite a few years so that led me to a stint of time in the office at Myer. Later I worked at a huge nightclub which hosted international acts also I spent some time in the fashion-manufacturing industry. Most of this work was either in the centre of Melbourne’s business district or close to the city edge. It provided me with many varied experiences of inner city life that are invaluable to me as inspiration for writing. But back to how the country experiences in my life have shaped me and my writing. My mum is a great inspiration to me. Once her family moved to Melbourne, she also found work as a bookkeeper but she never lost her love of the Australian bush and native flora. She instilled grounded values in me and a lifelong love of gardening. 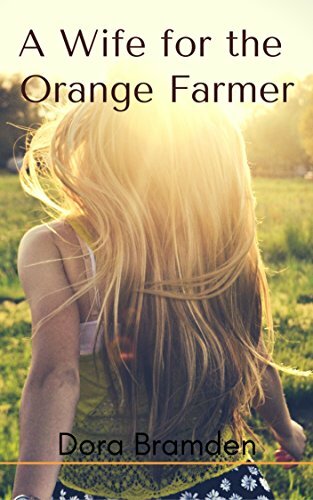 I have written a short story set in rural Australia called ‘A Wife for the Orange Farmer’ which was inspired during a visit to the Melbourne International Garden Show with Mum. We were caught in a thunderstorm and took shelter under a tree from the torrential rain. A rather handsome orange farmer came to our rescue with a golfing umbrella. He told us all about growing oranges up on the Murray which took our minds of how scared we were of being stuck by lightening. My cousin has been and always will be an inspiration with her love of living in small towns, her can do attitude (she even has a forklift licence) and honest values. She’s been there for me at a time when my city life was falling apart. She had me to stay with her in the West Australian countryside and gave me unconditional love. When Mum passed away last year she immediately flew across the country to be at my side. She’ll take on any challenge and generously love and nurture all who come into her world. While I have to admit to enjoy being very much a city girl, I think l have a country heart. Dora Bramden writes contemporary romance. ‘Healing Love, Passionate Romance’. How wonderful that you have so many different experiences to draw on, Dora! Your descriptions of city and country life are wonderful. I love the inspiration for A Wife for the Orange Farmer. Beautiful post, Dora. Both country and city life have their charms. I love your line: "a city girl with a country heart." That speaks volumes to me. I love the convenience of city life but get tired of the bustle; and sometimes all the sparkly seems just sparkly without meaning. I find the country life refreshing and the people real because there is no time for fake. However, too long in the country and I miss the multicultural stimulation of the city. You mentioned your book about country life. Which of your books would you recommend for city life? I want to get one of each.